For every shadowrunner in the sprawl, there's someone like you working the other side of the shadows. Your kind try to make a difference. As part of a DocWagon High Threat Response team, you've been on the receiving end of a firefight while trying to retrieve a client. You might wear the Lone Star badge, with orders to go undercover into the shadows you've sworn to eliminate. You may owe your loyalty to a corporation, proud to defend its secrets and assets from others who are ready and willing to take you down. As a reporter, you are committed to exposing those same secrets. If you love your country above all else, you may have dedicated your life to work for your government, ready to perform any task required. Missions is a collection of four Shadowrun adventures that allow players and gamemasters to experiment with the alternative campaigns presented in the Shadowrun Companion: Beyond the Shadows. In these adventures, the players can play a DocWagon High Threat Response team, Lone Star undercover police, corporate security agents, government commandos or even a media investigative team. 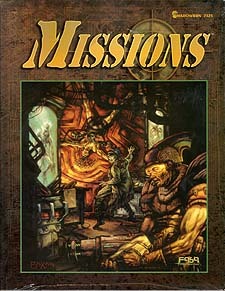 Missions includes suggestions for translating these adventures into campaigns and for incorporating an existing shadowrun team into these adventures. Missions is intended for gamemasters and players of all experience levels. For use with Shadowrun.